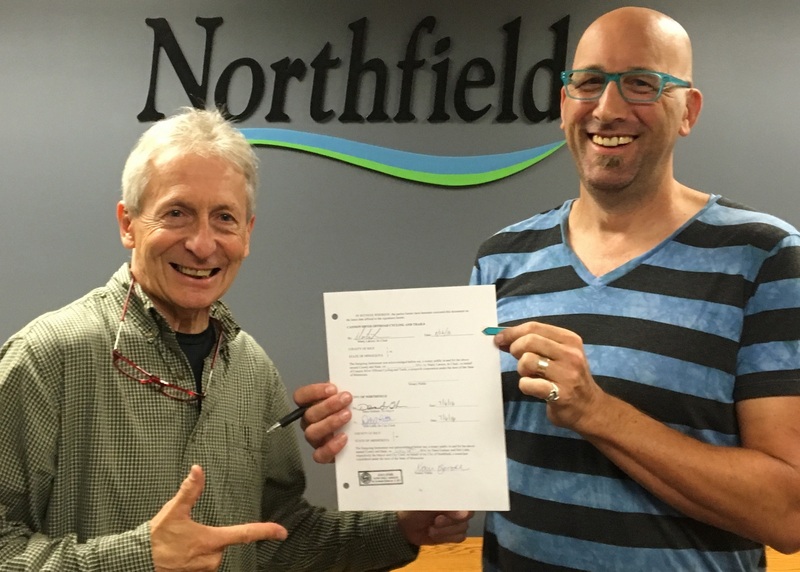 As of 11am Friday, we have a signed contract (MOU) with the City of Northfield, Minnesota for our trail in Sechler Park. 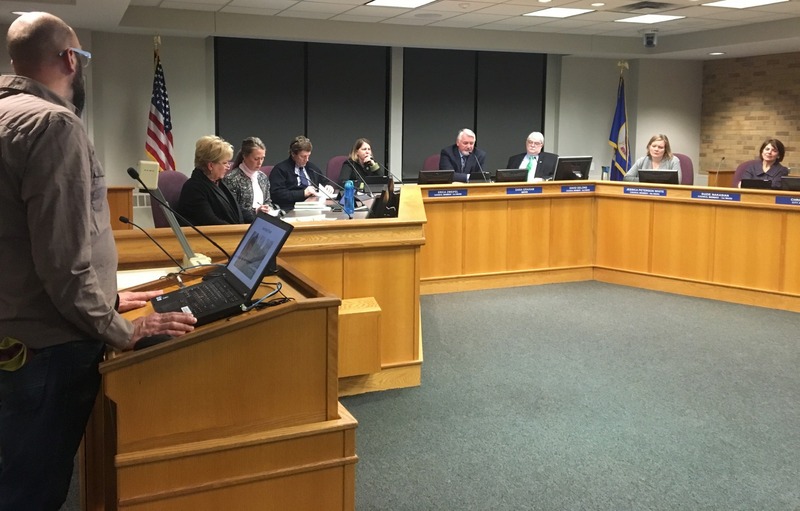 Props to City Engineer Dave Bennett, Streets & Parks Manager Jasper J Kruggel, the Northfield Parks & Rec Advisory Board (PRAB), and the Northfield City Council for their unanimous support. 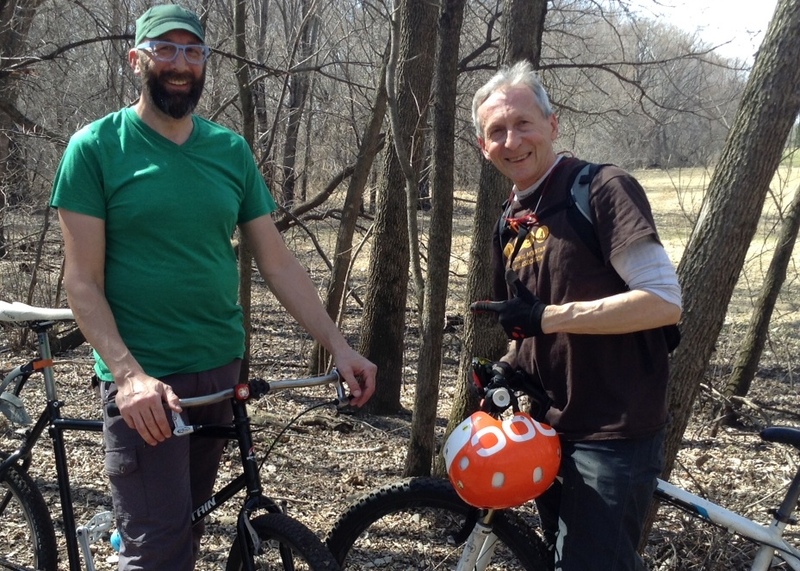 And a tip of the helmet to Matt Andrews at IMBA Midwest for his behind-the-scenes consulting. 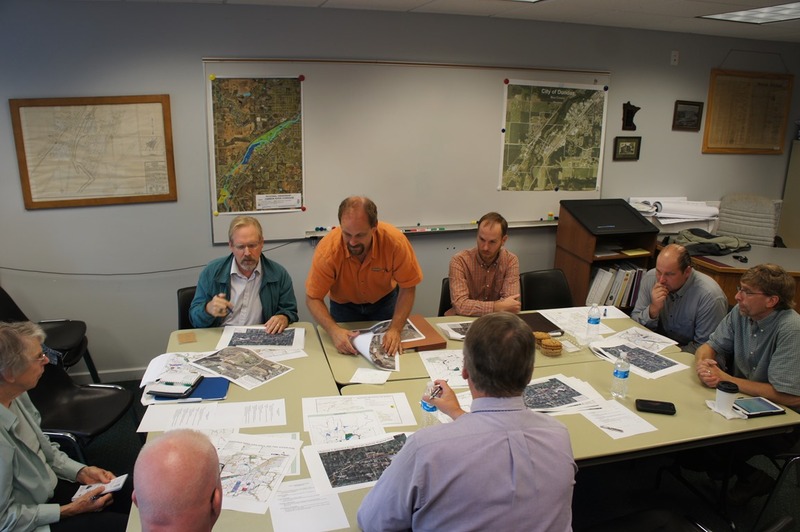 CROCT board members and Rice County Parks & Facilities staff have recently heard from some citizens who are concerned about our mountain bike trail-building activities in Caron Park. While we are reaching out to these citizens to meet face-to-face, we thought it would help to also address some of the issues here on our blog and invite further comments and discussion from anyone who might be interested. On August 21, 2014. CROCT Board members Marty Larson, Jeremy Bokman and I met with Jake Rysavy, Rice County Parks & Facilities Director, at his office in Faribault. 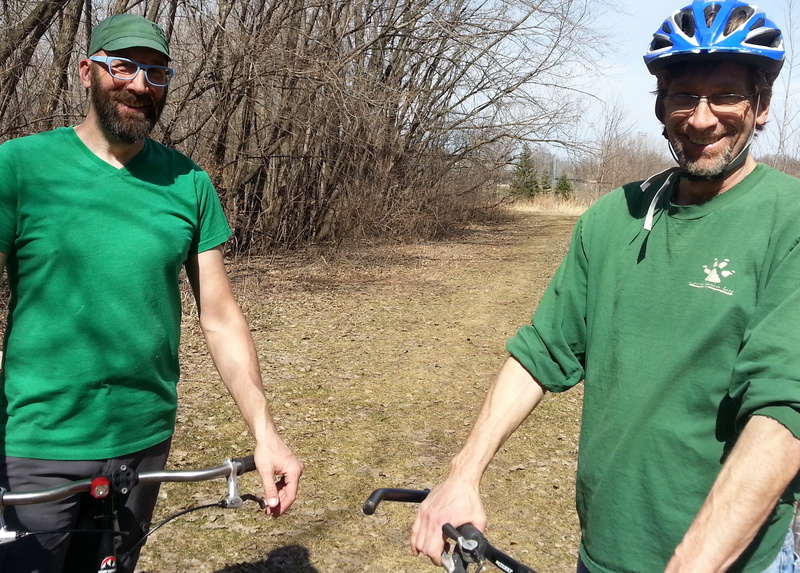 He expressed support for exploring the possibility of mountain bike trails at Caron Park between Northfield and Faribault and at McCullough Park near Montgomery. 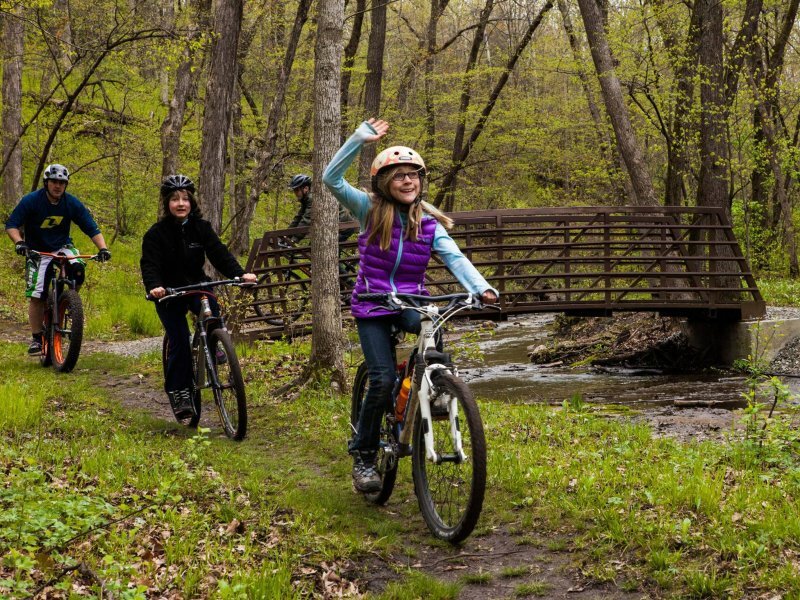 According to the 2010, Rice County Parks and , 51.4% of survey respondents (or 505 individuals of 972) stated that trails and bikeways are most needed in Rice County. This correlates with the South Regional Recreational Survey completed by the University of Minnesota, which identified 51% of individuals stating they enjoyed walking/hiking and 26% showing they enjoyed biking (biking includes bicycling of all types, including mountain biking). Trails serve multiple purposes. 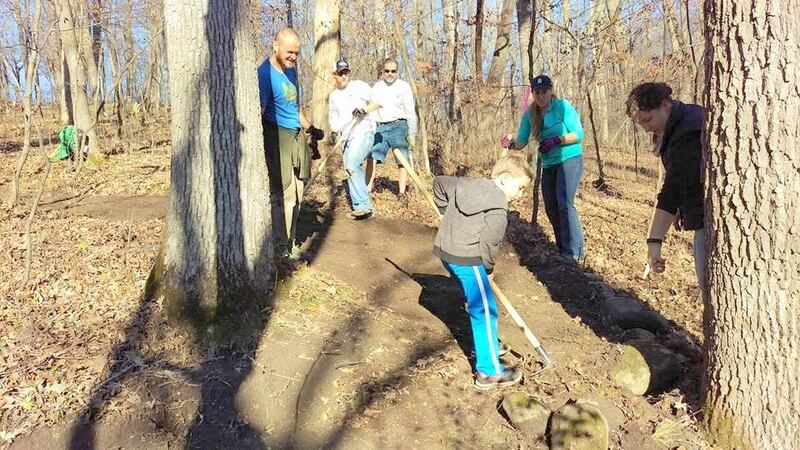 Trails function as transportation corridors, ecological corridors, opportunities to exercise and enjoy the outdoors, and opportunities to link people to Rice County destination points. Trails provide recreational, social, economic, and environmental benefits which contribute to a community’s overall quality of life. asdMountain biking received support from 18.7% (194 total) of the Rice County residents who responded. Other activities receiving significant support in the survey included Walking, Walking Dogs, Hiking, and Snowshoeing, all of which can be done on our multi-use trails at Caron Park. Mr. Rysavy also indicated at this meeting that one side effect of having more people in the park for a multi-use mountain bike trail at Caron Park might be to discourage vandalism and other illegal activities that were too often occurring at the park. 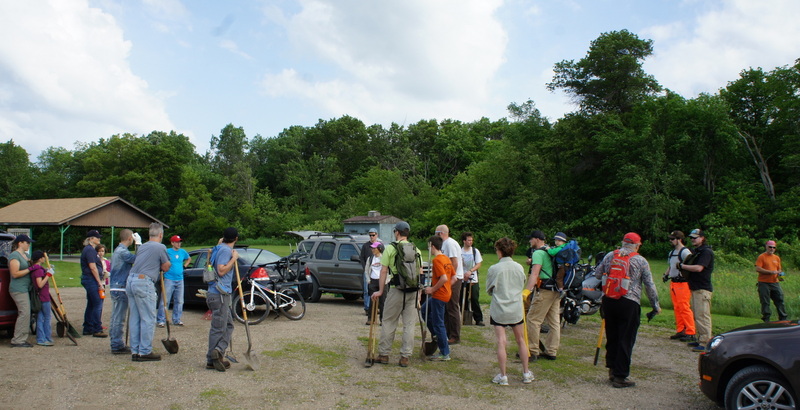 With his permission, CROCT volunteers flagged a proposed route for a trail at Caron Park in the fall of 2014. 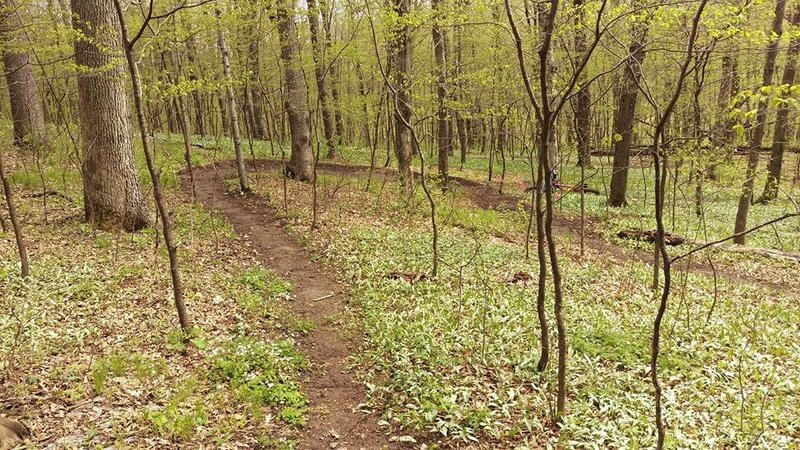 Over the winter, he informed members of the Rice County Board’s subcommittee for parks about the proposed trail and they expressed their support to him. 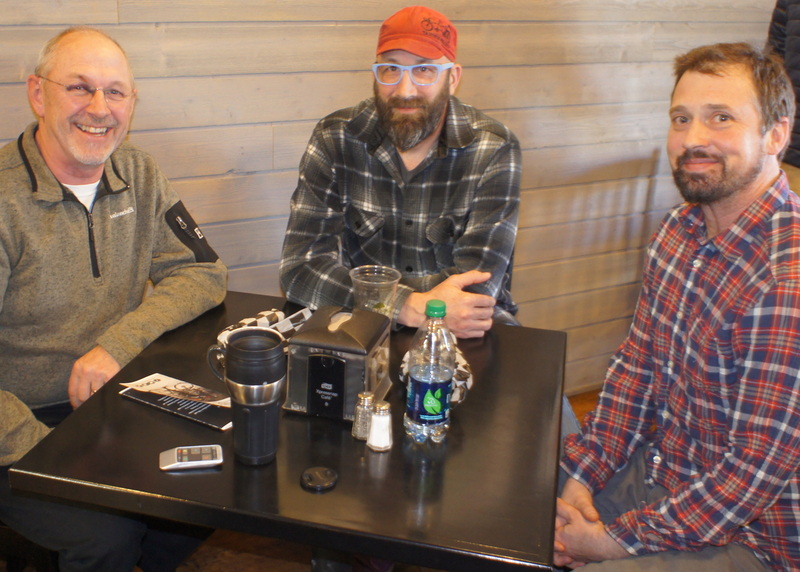 On Feb 5, 2015, Marty, Jeremy, and I met with Rice County District 5 Commissioner Jeff Docken about the Caron Park trail and to explore the possibility of another trail in McCullough Park. Mr. Docken was supportive and had no objections. After Marty and Jake Rysavy walked the proposed trail in the spring, he gave CROCT his permission to construct the trail. 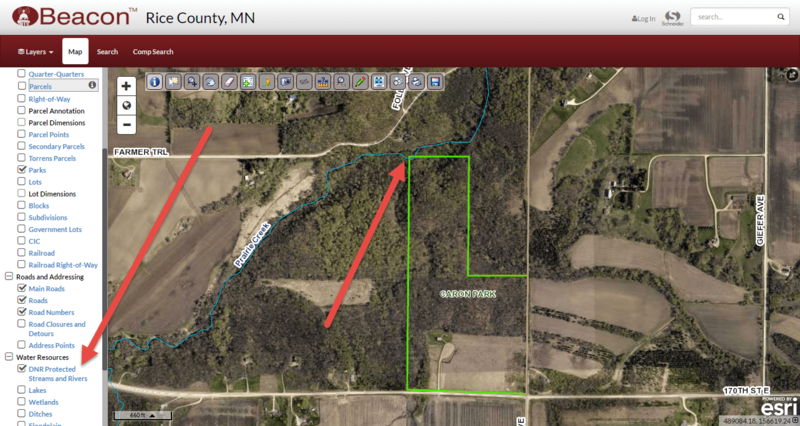 Caron Park is a gorgeous natural area but there’s nothing in the Rice County Parks plan that indicates it’s a wilderness park. 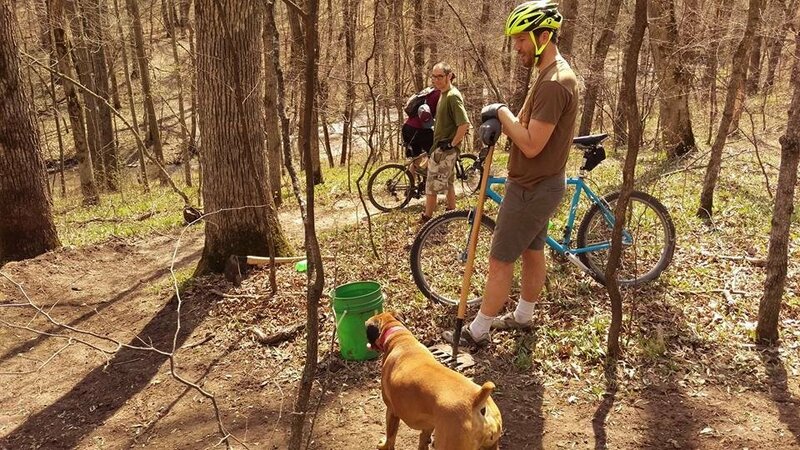 Our mountain bike trail there is similar to the mountain biking and hiking trails at River Bend Nature Center which are designed to encourage and accommodate human activity in the midst of nature. (The Caron trails are in fact quite a bit narrower and more “natural” than those at RBNC.) CROCT is a chapter of the International Mountain Bicycling Association (IMBA), whose Rules of the Trail guide our work. For instance, the Rules instruct riders to never scare animals or deliberately disturb wildlife and to yield the trail to other users such as pedestrians or dog-walkers. We regularly educate CROCT members about these rules. Unlike the pre-existing trails at Caron, CROCT’s trail was designed to be sustainable and erosion resistant, constructed with a slightly crowned tread on flat terrain or an outsloped tread on sloping terrain. We regularly announce (via social media) closure of the trail when it’s too wet to walk or ride without damaging it. Lastly, while Rice County has not informed us about any protected plant species in the park, a hiking/biking trail can help to protect plants in the park by concentrating visitor ‘trampling’ on the narrow trail. The pink flags and tape currently visible on the existing trails were placed during trail construction and will be removed by early June. They were left in place over the winter and early spring as a means to help users stay on the trail. 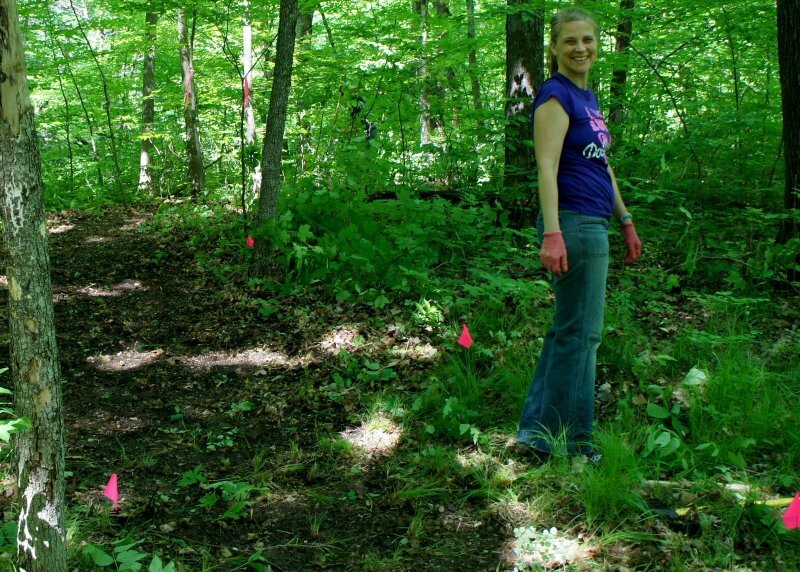 The pink flags and tape in the wooded area adjacent to the glacial erratic boulder mark our proposed expansion of the trail in that area to prevent erosion and make that section of the trail more enjoyable to ride/hike than the current trail, which has existed for many years but runs straight up and down the hillside. All of the streams on the protected waters list are in the protected streams layer on Beacon. The intermittent stream that flows through Caron Park is in the “DNR Intermittent Streams” layer under the Water Resources folder on Beacon. So, the unnamed stream that runs through Caron Park to Prairie Creek is not one of the unnamed streams on the protected streams list. A pedestrian bridge crosses one of the streams in Caron Park (see photo above) and mountain bikers use it to cross over the stream. In no other segment does the mountain bike trail bring riders close to either stream. And we educate our ridership on the importance of not riding across or in the streams to prevent erosion and sediment disruption. We’re interested in getting feedback on our response to these concerns and discussing the issues online, phone or face-to-face. Feel free to attach a comment to this blog post or contact us. 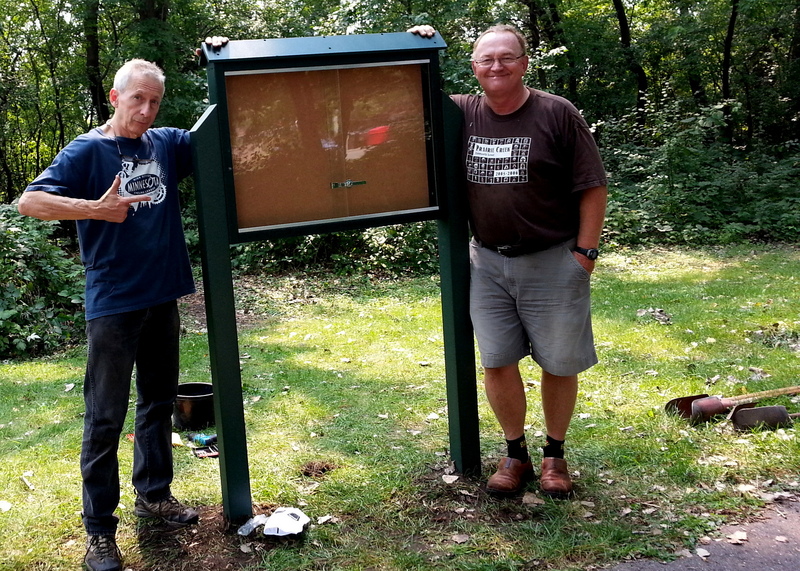 This type of kiosk was recommended to us by TJ Heinricy, Streets & Parks Supervisor with the City of Northfield. 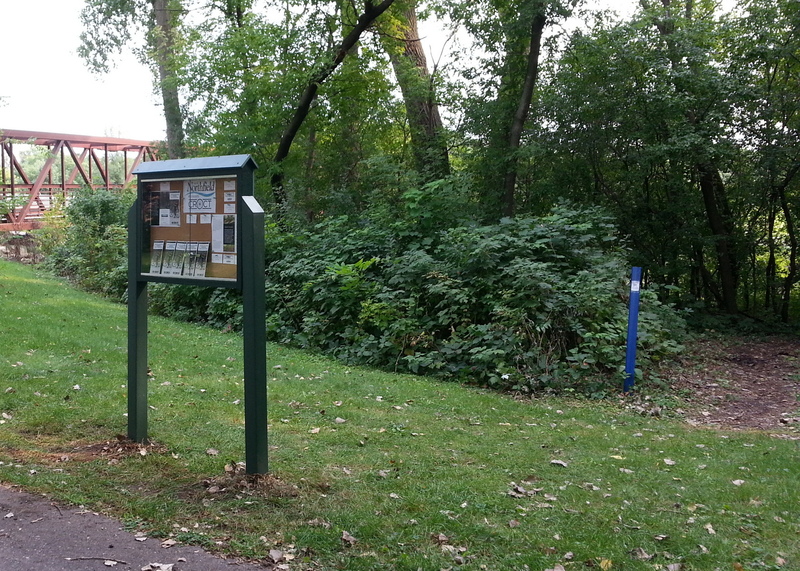 (There’s a similar one in the Babcock Park dog park just across the Cannon River. ) Since this portion of the park is in the flood plain, he thought it best to avoid anything too fancy and anything made of wood. CROCT paid for it ($475) and TJ covered the not-so-insignificant shipping costs out of his parks budget. So thank you Bill and TJ, and thank you to all CROCT members and CROCT donors. Your financial support paid for the kiosk. 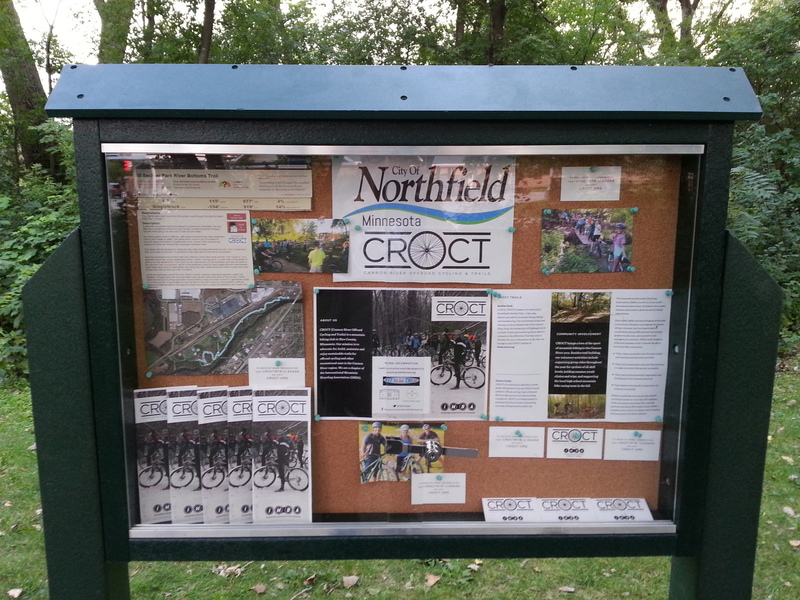 Peter Hark is a resident of rural Northfield, the DNR’s Field Operations Manager State Parks and Trails, and a Founding Supporter of CROCT. He joined me and Marty Larson on his first ride on the Sechler Park MTB trail on Wednesday, a day off for him because it was his birthday. He seemed to enjoy the ride and was complementary on what he saw. For a relatively new mountain biker, he’s not half-bad, and if he got a proper mountain bike with better tires he would definitely be more than marginally adequate. 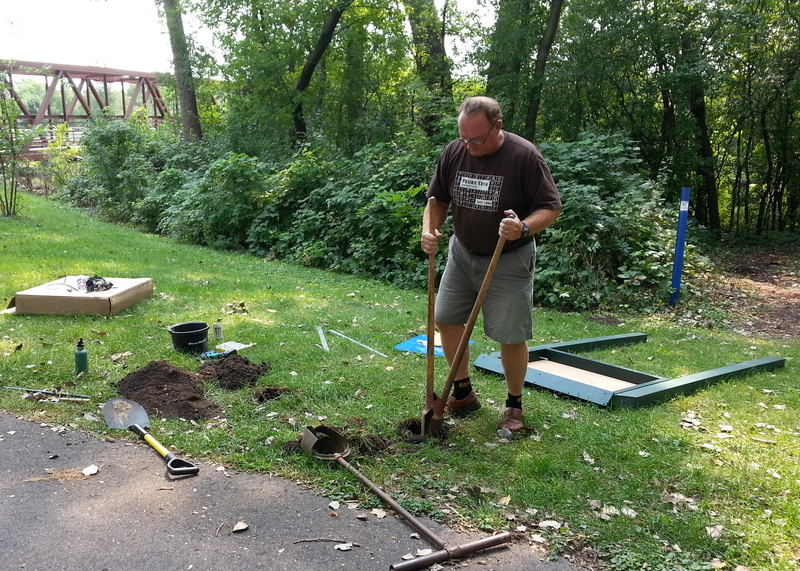 I first met Peter in March 2013 at the MN Parks and Trails Council of Minnesota’s Day on the Hill. Later that year, he was part of a DNR team that met with local Rice County public officials in Dundas for a Mill Towns Trail update. And he may have gotten his first real taste of mountain biking at the 2013 PedalMN Bike Summit, held at the DNR’S Cuyuna Lakes MTB Trail system in Crosby/Ironton.